In some trig problems, you may be given two sides of a triangle and an angle that isn’t between them, which is the classic case of SSA, or Side-Side-Angle. In this scenario, you may have one solution, two solutions, or no solutions. The best approach is to always assume that you’ll find two solutions, because remembering all the rules that determine the number of solutions probably will take up far too much time and energy. If you treat every SSA problem as if it has two solutions until you gather enough information to prove otherwise, you’ll be twice as likely to find all the appropriate solutions. Gaining some experience with solving a triangle that has more than one solution is helpful. The first set of solutions that you find in such a situation always contains an acute triangle. The second set of solutions always contains an obtuse triangle. Two possible representations of an SSA triangle. Figure a shows you what the picture may look like. However, couldn’t the triangle also look like Figure b? Both situations follow the constraints of the given information of the triangle. If you start by drawing your picture with the given angle, the side next to the angle has a length of 20, and the side across from the angle is 16 units long. The triangle could be formed two different ways. 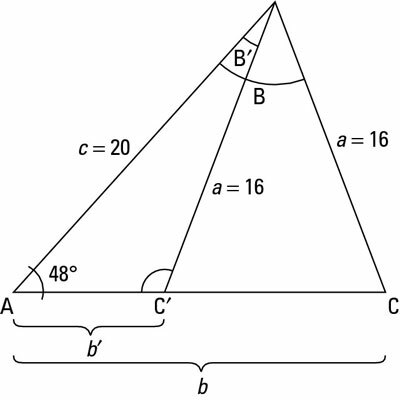 Angle C could be an acute angle or an obtuse angle; the given information isn’t restrictive enough to tell you which one it is. Therefore, you have to find both sets of solutions. Fill in the Law of Sines formula with what you know. Set two fractions equal to each other so that you have only one unknown. Cross multiply and isolate the sine function. Take the inverse sine of both sides. Plug the final angle back into the Law of Sines formula to find the third side. However, if you plug sin–1(0.9319) into your calculator to solve for theta, 68.27 degrees is the only solution you get. Subtracting this value from 180 degrees gives you the other ambiguous solution for angle C, which is usually denoted as angle C’ so you don’t confuse it with the first solution. to find the second angle of the second triangle. Find the measure of the third angle. because the three angles must add to 180 degrees. Plug these angle values into the Law of Sines formula. Set one fraction with an unknown numerator and the fraction with a known numerator equal to each other in the formula. Cross multiply to solve for the variable. List all the answers to the two triangles (see the previous numbered list).